New egg safety standards went into effect in July; regular salmonella testing is now required. What began on Aug. 13 as a recall of 228 million salmonella-tainted eggs has expanded to cover more than half a billion eggs produced by two Iowa companies--making it the largest such recall in U.S. history. Yet despite the frenzy that now often follows allegations of unsafe fare, organized, company-driven callbacks were hardly the norm during the early days of industrialized food. It took years of advocacy and outrage, capped by The Jungle, Upton Sinclair's muckraking work on the meatpacking industry, to spur Congress into passing the Pure Food and Drug Act of 1906. The landmark law established standards for the transportation, inspection and labeling of food and led to the eventual creation of the Food and Drug Administration (FDA). The first major national food recall occurred in 1920, when an outbreak of botulism linked to improperly canned olives compelled the government to pull the product. Just before Thanksgiving in 1959, the FDA seized cranberries laced with a potentially cancer-causing weed killer and advised consumers not to purchase the holiday staple. These days, the rise of factory farms and agribusiness has magnified the potential scope of an outbreak. When something goes awry, recalls can span continents. Britain's 1986 discovery of mad-cow disease led to an eventual ban on British meat in the European Union. And in 2008, the presence of the poisonous chemical melamine in several Chinese dairy products caused food to be pulled from shelves worldwide. The FDA has planned extensive egg-farm inspections to combat the recent salmonella scare, but the fact that the bacteria's source remains unknown has made an outbreak-weary public ever more distrustful of an industry accused of lax oversight. 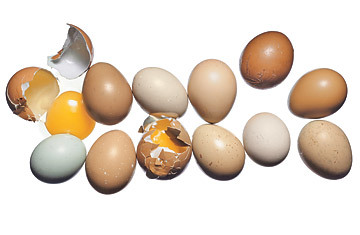 Egg lovers might want to switch from sunny-side up to hard-boiled--at least for a little while.